With the festive season nearly upon us,now is the time to start planning your gift list. I like to include some handmade items with my gifts – nothing beats a handmade, one-of-a-kind gift. I have collated 10 gift ideas for Sewists. These are fun, quick to make items, that you can include for your crafty friends. These are made using our free sewing/craft tutorials or pdf patterns. I hope you find some ideas to inspire you in your Christmas sewing. Click on the image or the link to be taken to the original blog post for more details. The mini Hexie Pincushion is perfect for crafting on the go! It features a mini hexagon flower and is a fun way to use some of your favourite fabric “scraps”. The Travel Sewing Kit is handy for quick repairs when travelling, or for crafting on the go! Featuring room to safely store pins, needles, safety pins, buttons, scissors, and more! Despite its petite size, it can hold all the essentials. The pattern is available from our Craftsy and Etsy stores. This set of nesting, gathered round baskets, are great for organising the sewing room. They can easily hold a range of craft supplies on your desk so they are close at hand. Dress up a small retractable tape measure with fabric and felt flowers. These look great int he sewing room or basket, and can be quickly assembled using our tutorial. The Hexie Sewing Kit is a handy zakka style sewing accessory for crafters on the go. Made from polka dot linen and pretty floral fabric, it is embellished with pretty mini English Paper Pieced hexagons, lace, buttons, ribbon, and a leather patch. The inside of the kit features a piece of felt to safely store your needles and pins; and a pocket to store a pair of scissors, and other sewing essentials. Pattern is available in our Etsy and Craftsy stores. This handy knitting and crochet project pouch is the perfect size for crafter’s on the go. Stow your latest knitting or crochet project in style. It is easily constructed from three fat quarters of co-ordinating quilter’s cotton. This knitting and crochet project pouch would make a great gift for a crafty type.You can find our free tutorial here. These little triangle pouches are fun to make and are perfect as small coin purses, to hold make-up essentials, or a few sewing supplies. Made from four strips of fabric, they are quickly assembled and make great little gifts. The fun part is choosing four co-ordinating fabrics. Be warned, it is hard to stop at one! You can find our free tutorial here. Crafty friends can decorate their inspiration/noticeboard with these sweet yoyo pegs. You can find the free tutorial here. Make a batch of dress form gift tags for a sewist. These are fun to attach to handmade gifts, and feature some lovely Liberty of London lawn fabric. 10. 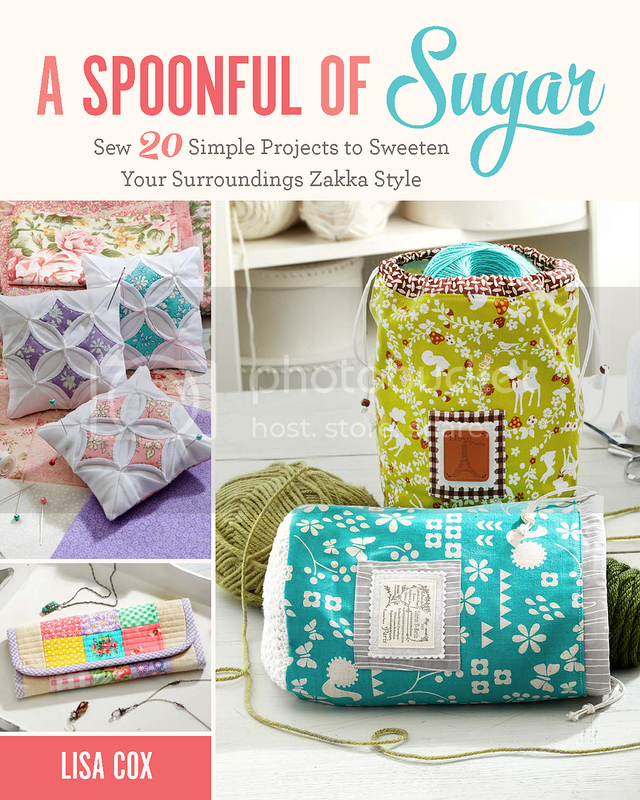 A Spoonful of Sugar: Sew 20 Simple Projects to Sweeten Your Surroundings Zakka Style. My book contains 20 projects that would be perfect as gifts for those that love handmade. Check it out at Amazon. Hope these projects have given you some inspiration for your Christmas sewing. Nothing beats the joy of making and gifting something you have crafted yourself. Hi Lisa and Sarah! Thank you so much for the gift ideas for sewing friends. I have your book and have picked some ideas from there as well. I treasure the beautiful stitchery bag you sent me along with the adorable hedgehog pin cushion for the online bag exchange years ago now. I hope all is well with your family.